Translated from Portugese: Fan-TAZ-tic!! Taz, the hilarious and famous Tazmanian devil returns in a hilarious adventure that will leave you laughing. Marvin the Martian was looking around the Solar System for new attractions for the National Mars Zoo. In each planet he passed he selected only the most exotic of creatures and had them immediately teleported to Mars. And here on earth he decided to capture our hero, just as he was sitting, relaxing in his home. Just as he did he suddenly found himself in a dirty cage in totally new surroundings. But not even Marvin could have imagined the diffculties that may have arisen from doing so... With new and incredible tricks, Taz sets forth to create the biggest confusion in the zoo to escape captivity. And it's you who help him along the way. There are five incredible stages, where you try to find several well-known characters from Looney Tunes. 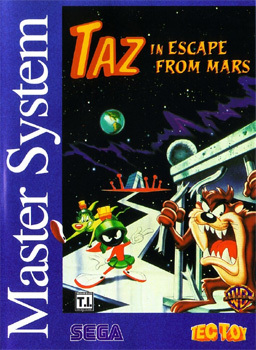 Oh, one more detail, don't forget to feed Taz during the game, because you know how irritated he gets when he's hungry. But be careful with the food. Amongst hamburgers, Peruvian meats and fruits, there are also bombs in the way, along with cakes. Therefore, it's up to you to decide what to devour.